FMJ or Lead Bullets for .38 S&W K frames? Does it make a difference whether you feed them lead or FMJ bullets? Are .38/.357 FMJ bullets taper crimped, or roll crimped like our cowboy guns? They should be fine with lead or jacketed bullets. 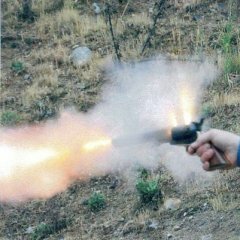 Revolvers cartridges need to be roll crimped. S&Ws will digest any pill you put in the case. 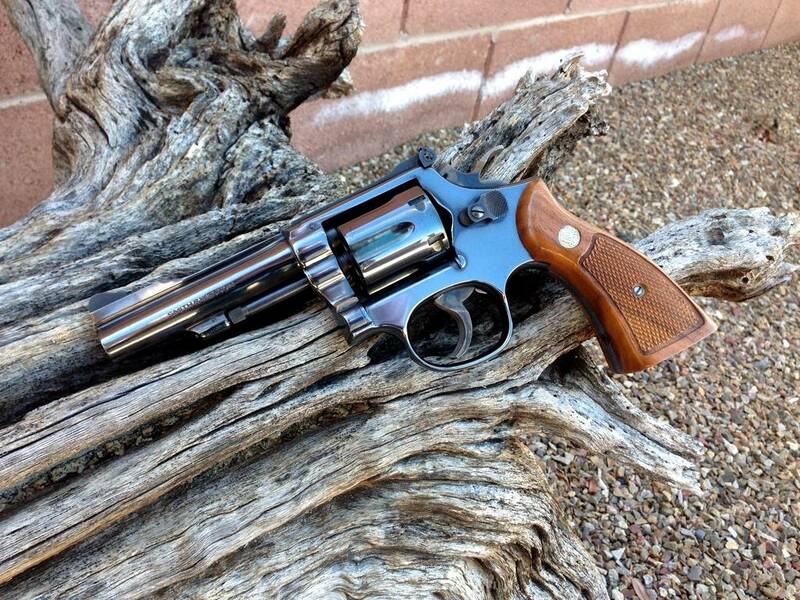 I grew up on their revolvers and still consider them to be the finest handguns ever built with five or six cylinders. Especially true in the vintages you describe. Crimp type doesn’t matter to a revolver, but roll crimp is most common. I have several Ks and can verify that they shoot better than I can hold them with home cast lead. I’m loading light to midrange .38 Special without any trace of leading. Maximum loads in .357 with lead bullets might be different but I have no interest in testing that out. Slim, I have models 36, 10 and 19. All three shoot lead or jacketed ammo with no issues. Supposedly you can even fire +P loads in model numbered guns made after 1957. I stick with standard loads, mostly because I want my revolvers to last and I don’t trust that years from now that S&W will talented enough gunsmiths, or parts to repair my older guns so I treat them well. Model 19’s have been reported to have cracked forcing come issues. This comes from using lighter grained bullets in magnum loads. I have no experience with this so I rely on others that do. We can’t link forums here but there has been a lot of discussion on the subject. Some info is bullish...hogwash, but much is right on the money and is reflected in the article I have linked here. I hope you find a really nice revolver at a very nice price. I have had models 10, 19, 64, 686, 36, 442, 638, 640, 649. The vintage ones are definitely best. There will be some leading using roll crimped wadcutters but a good cleaning regimen will take care of that. For defensive purposes I use factory jhp. Thanks for the input everyone. Glad to hear lead is ok. Already have a Glock which I prefer for CC, so this will be a range gun. Loads will be mid-range just like my cowboy guns. 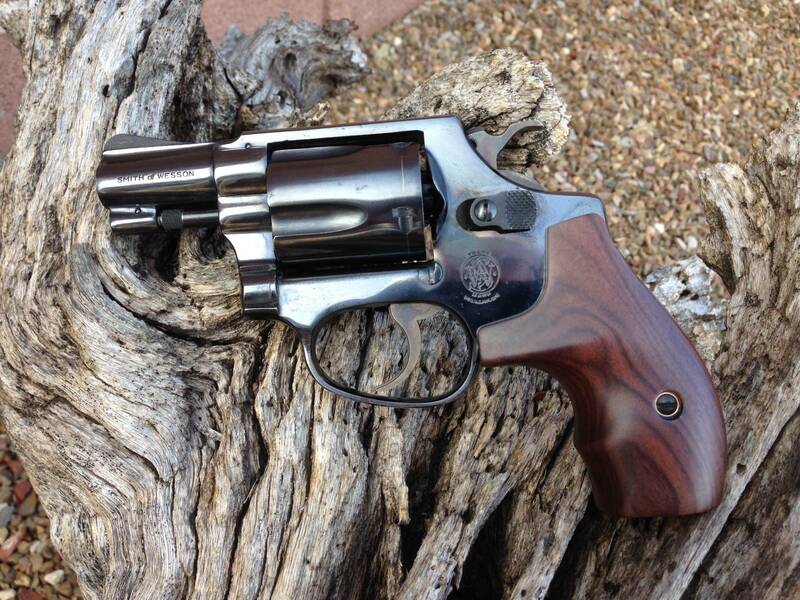 Even if I end up with a .357, it's gonna be feed .38 Special like my cowboy Ubertis. No need for the extra recoil. And just so you know, I blame J-Bar for all of this. It was his his pics in another thread that lit my fuse to get one of my own. Some guns group better with the 125s, some with the 158s, some don’t care. Guns are snowflakes, each one is different. I’m proud to be responsible for a new addiction!! Of course we expect pictures when you return from the gunshow. He said Some info is bs but much is right on the money. Like most gun discussions. I agree. Link doesn't open for me, but thanks for the heads up. I wasn't aware of this issue on the 19 and will do more research. Is the problem confined to a particular "dash" range, that is 19-1 thru 19-7 etc.? I assume a this kind of crack is visible to the naked eye? Slim, what I have heard is that 19s (and I suppose therefore, 66s, 13s and 65s) have a possibility of the barrel cracking at the forcing cone, when using 125 grain 357s. I have not heard of it with any other weight, nor with any type of 38. Just 357 125s. My solution is to use 158s in my 19. I shoot the 125s in the Python. They quit making the K frame 357s for a few years, but recently brought the 66 back. The new 66, unlike the older guns, has a bull barrel. This thicker barrel may have solved the problem of the barrels cracking. If I was going shopping for a used Combat Magnum, I would make sure to have a powerful magnifying glass and a powerful flashlight with me, to check for a crack. I understand that if you have one that is cracked, you are SOL, as they have no more barrels at Smith & Wesson. Shoot Hi-Tek coated bullets in it. Cheaper than jacketed rounds and cleaner than conventionally lubed bullets. BTW Jacketed rounds will have a crimp groove to accomidate a roll crimp. Hot loads are of no interest to me, and a .357 revolver is on my "B" list. However, this thread has been very informative on the chance I consider one. More knowledge is always more better when shopping! My department carried Model 10's for 27 of my 30+ years. When we switched to 38 +P jacketed ammunition, we had forcing cones crack on a real regular basis. We were burning in the neighborhood of 140,000 rds of ammunition per year through our range weapons just for my facility so were losing 15-24 forcing cones annually. This was happening even with +P proofed barrels. If memory serves me, the forcing cone is factory cut at 6 degrees. If you have the forcing cone cut to 11 degrees, there is less of a problem. We had no problems with them when we carried and used lead hollow points. The most accurate round for target shooting out of a K-Frame Smith is a 158gr hollow based wadcutter with a mild charge of your favorite powder. My favorite is 4.5 grs of Unique. Can't add much more than has been said above. My vintage S&W revolvers that shoot 38's. 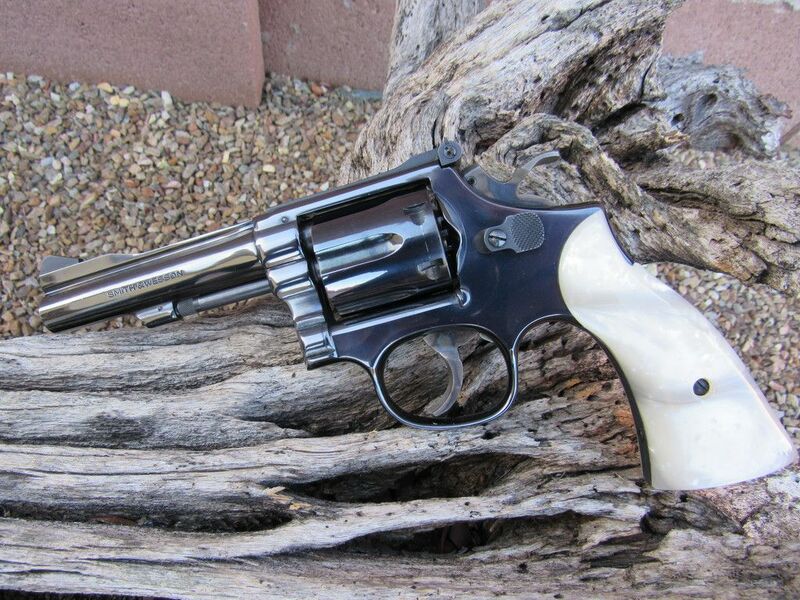 S&W Model 36 "Chief's Special" in 38 Special. 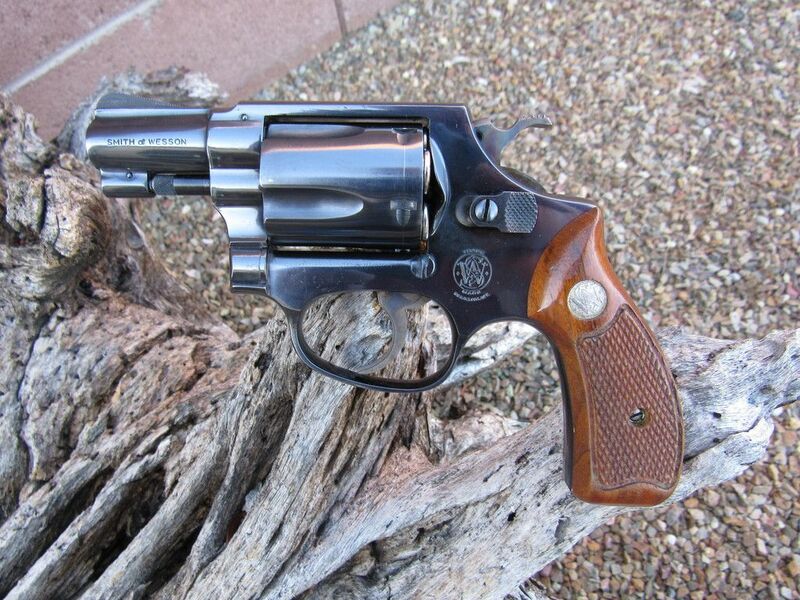 Love my S&W revolvers....a lot!! Yes you do and it's wicked. Dang it Bird Gun, yer making my itch even worse! Life does have its difficulties. 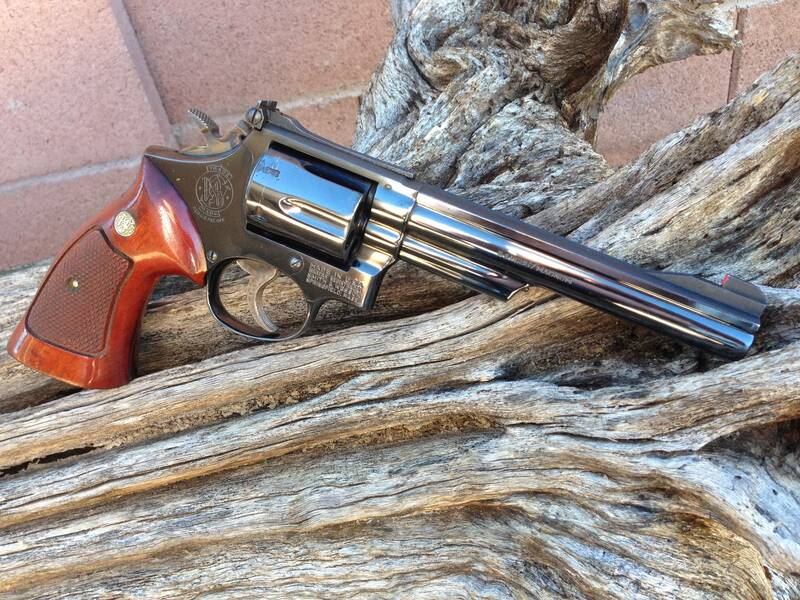 S&W Model 15-4 "Combat Masterpiece" in 38 Special with Altamont faux Pearl Grips. My wife has claimed this revolver as her's and she wanted "prettier grips." 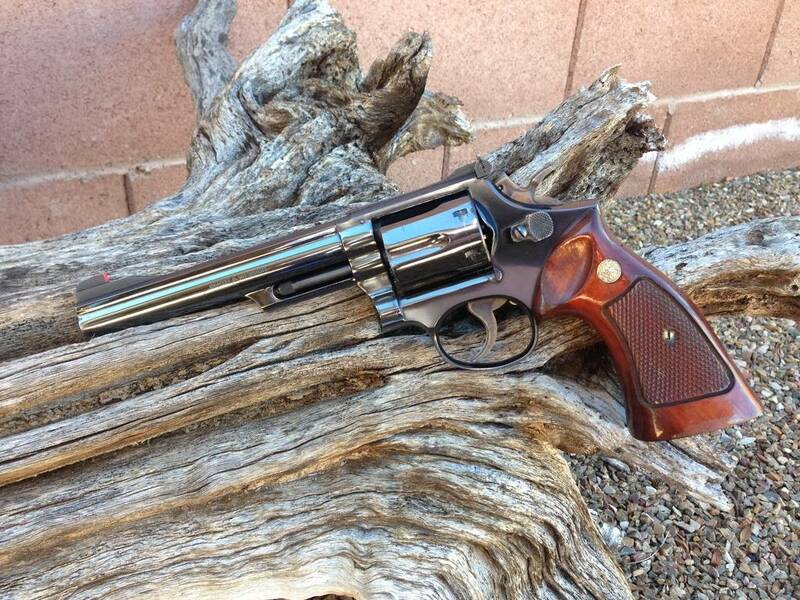 S&W Model 19-3 "Combat Magnum" in 357 Magnum with factory Target Grips. I shoot this revolver better than any other handgun I've ever shot. Dang, Birdgun. Your revolvers are very nice looking. I love mine but they aren’t lookers like yours are. That doesn’t mean I enjoy them any less.